Are your kids counting down the days to the release of the Angry Birds Movie? My kiddos LOVE watching their Daddy play Angry Birds. We saw the preview when we went to see The Good Dinosaur and my daughter got super excited. It looks really funny and even I can't wait. It's in theaters May 20th, but you can watch Angry Birds Toons now on Netflix. National Geographic Kids Books is going a little Hollywood this Spring, with the release of the ONLY official movie tie-in book with a non-fiction, educational twist. 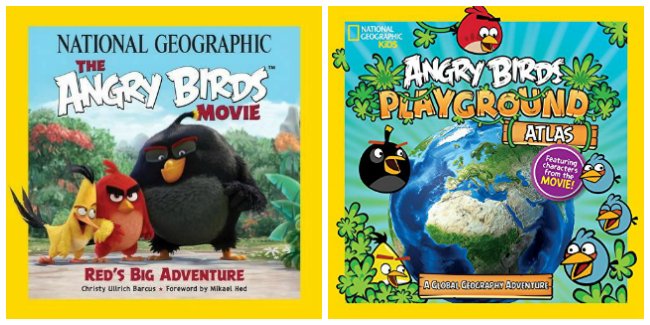 From understanding the physics in the games, to exploring the seasons, to blasting into space, the Angry Birds series of books are a fun and entertaining way to understand the science and culture behind the most popular game in the world - and The Angry Birds Movie: Red's Big Adventure book is no exception. 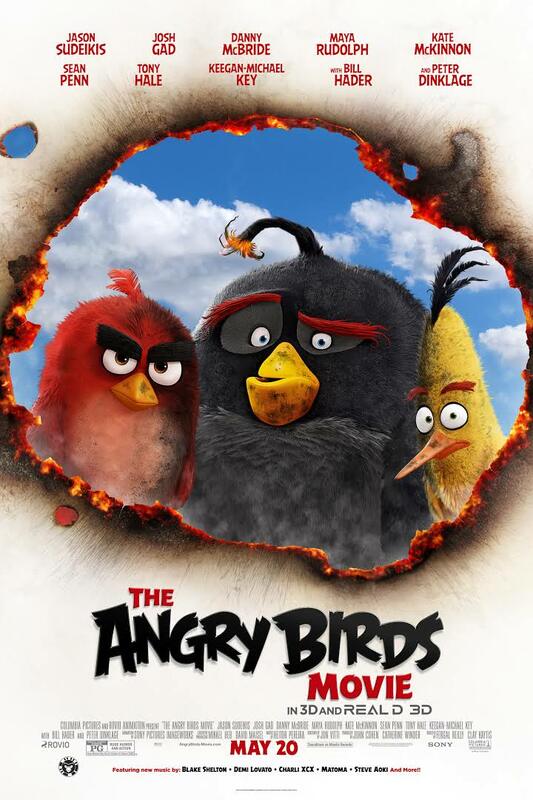 National Geographic The Angry Birds Movie: Red's Big Adventure is the latest entry in the National Geographic Angry Birds series that will take you on an amazing journey with Red, the leader of the Angry Birds flock, along with Matilda, Chuck, Bomb, Terence, and the mysterious Mighty Eagle. Featuring The Angry Birds Movie (2016) story world, this book is filled with all the fun facts and information Red and the flock need to embark on their big adventure. From identifying wildlife to navigating by the stars to building a shelter and setting traps (for any roaming Piggies), this book will be sure to educate and entertain. 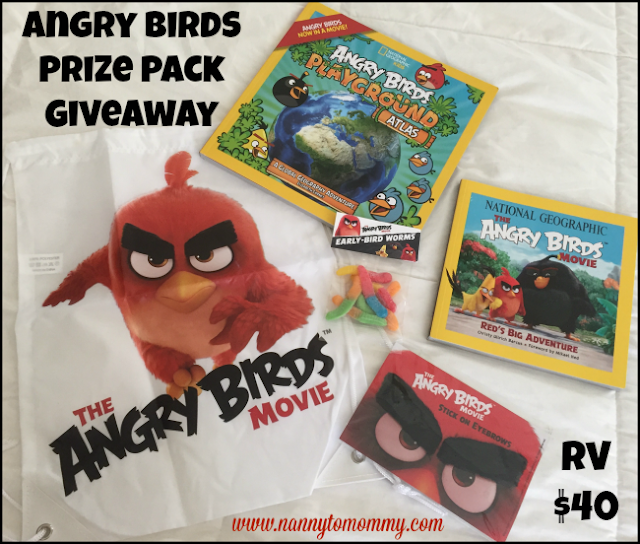 One lucky Nanny to Mommy reader will win an awesome Angry Birds Prize Pack valued at $40! The giveaway consists of: 1 copy of The Angry Birds Movie: Red's Big Adventure book, one copy of one Angry Birds Playground: Atlas book, Angry Birds Early Bird "Worms", and an Angry Birds fuzzy eyebrows pack, all packaged together in an Angry Birds drawstring bag. Entry is simple, just follow the prompts on the Rafflecopter below. Open to US only, must be 18+ to enter. Make sure to follow us on Facebook so you can stay up to date with our current giveaways. Good luck! Welcome to the "May the Odds Be Ever in Your Favor" Giveaway Hop! A group of bloggers has put together some amazing giveaways for you (with the minimum value of $15 each – but some are much more than that!). Be sure to enter them all – there is no limit to how many you can win. GOOD LUCK! I received complimentary products to provide this post. All opinions are my own. This post contains affiliate links. Participating blogs not responsible for sponsors who do not fulfill prizes. This contest will run through May 30, 2016 at 8:59 pm PST (11:59 pm EST). Winners are chosen via Random.org, ALL winning entries ARE verified. The winner will be notified by email they signed up with and will have 48 hours to reply or another winner will be chosen. No purchase necessary. Open US only. Must be 18 years or older to win. I received complimentary products to share this review and giveaway. This promotion is in no way sponsored, endorsed or administered by, or associated with, Facebook. You understand that you are providing your information to Nanny to Mommy and not to Facebook. Please note that Nanny to Mommy is not responsible for sponsors that do not fulfill their prizes. We have represented each sponsor with the expectation they will fulfill their prize and in a timely manner. We will contact the sponsor regarding your prize. The sponsors, in most cases, are shipping their items to you directly. I will make every effort to assist you in obtaining your prize. If there is an issue with a sponsor, please notify Nanny to Mommy at Diana.n.chastain@gmail.com within 4-6 weeks for assistance, after that we may be unable to assist you. My daughter would love it if I gave her all the Angry bird items they love the Angry bird in my family the new movie looks so cute too. My grandkids would like this. The movie looks cute, and they have always enjoyed the game. I would like to win this for our son. He loves birds so I'm sure he will like this movie. THis would be for my oldest son. He's a huge angry birds fan. He even had an angry birds theme party! I would give this to my daughter because she would enjoy reading the books. I would love to win this for my little grandson. He just loves Angry Birds. I would give this to my kiddos if I won. It would be great for the start of summer. I would love to win this for my sons because they love the movie so much! My nephews love Angry Birds and by the time they grow out of it, it can be passed to my granddaughter. Spreading the love! I would love to win this for my daughter to give her best friend. Her best friend is a major Angry Birds fan and my daughter would be so happy to give her this. I'd love this for my youngest grandson. I would love to win this for the little kids in the house. They would love to play with these things. Especially the bag. They like to pretend they are going on a trip or taking all the toys. I would give it to my niece. She would love it. We love the Angry Birds. I would give it to my granddaughter. She would love it too! My son!! He LOVES angry birds!! I would give this to my son because he is a big angry birds fan I am excited for my son to try to win this. I would like this Angry Bird package to go to my son. This would be for my grandson Layne He LOVES National Geographic! I would give this to my son since he is into Angry Birds. I would give this to my daughter, who plays Angry Birds at least once a day on my tablet. When my son was 3, he had multiple strokes. After that for Christmas my friend send him a few angry bird sets, that you build and knock down. Every since then he has loved angry birds! I think the sets helped him recover better and regain his use of his arms again. So I know my son would love this prize! He is 6.5 now! I would love this for my nephew. He loves Angry Birds! My granddaughter lives and breathes Angry Bird. I am planning on taking her to the movie!! I would give this to my little cousin. I absolutely love the angry birds. I think they are so cute. I would give this Angry Birds Prize Pack to my niece and nephew. They would be entertained and enjoy it. I would give this to my kids who are excited about the new movie. My son is moderately obsessed with Angry Birds - he would love this!! This would be for my kids, they really like AB. I would give it to my son. HS been obsessed with them since they first came out. My son loves Angry Birds. He talks about them constantly and I'm still trying to figure out what exactly they are?! I would love to give this to him for his birthday. I would give this to my daughter. I'm excited about it because she loves books and Angry Birds!! I would give this to my neighbors daughter. She would love this. I'd give this to my boy. I would give it to my daughter. I would be excited for her because she loves Angry Birds. I would give it to my 2 kids. They love angry birds, they are excited to see the movie. I would loveto give this to my sons who LOVE angry birds! I would give this to my grandaughter Evelyn.She loves angry birds and I would love to see her face if she got this. My grandson would love this prize. I would give it to him. My 9 & 6 year old kiddos would love this! My grandson loves Angry Birds. He says they are cool!!!! I would give this to my children if i won, they would love it! This would be for my 2 young grandsons...they are big Angry Bird fans. I would give this to my friend. She is Angry Bird fan. I would give this to my nephew. He loves Angry Birds! I would give this to my kids. They all love angry birds. I would love to give this to my boys when we surprise them with a trip to the drive-in to watch the movie. They LOVE Angry Birds. I'd love to win this for my nephew who is a big Angry Birds fan. Thanks. My son really likes Angry Birds so I would give it to him if I won. I would give this prize to my niece! I will give this to my granddaughter, she loves the Angry Birds. If I was lucky enough to be the winner this would be for my 3 children. My daughter would love this. She just loves birds. My Son is simply obsessed with Angry Birds. After after taking hm to the movies to see it Ill admit it was super cute! Lori Jackson is my rafflecopter name! My grandson loves to be read to. Everyday we go through at least 10 books. He'll even grab a magazine. My little niece would like this! She just loves Angry Birds! I am giving this to my godchild. I am giving this to my godchild who is a huge fan of angry bird. I would like to win this for him. I would give this to my niece. She loves fun things like this! This would be for for my boys! They would love it! I would give this to my son. He loves Angry Birds. I would like to win this to give to my niece because she is a huge angry bird fan.